Another Sunday, another vide grenier. I saw a few things, but nothing particularly took my fancy. There was a keyboard. Not sure of the model, but it was a Roland with MIDI ports and lots of buttons. The problem? Two of the keys were sticking up, at like a thirty degree angle. At a guess, I would say it looked like way too much enthusiasm with an electric guitar totalled the keyboard. I bet some choice expletives were uttered when that happened. But, the tag on the keyboard said they wanted a fiver for it. Didn't seem worth haggling. I handed over some change and walked away with a massive keyboard. Getting it home, the first thing was to strip it down. The good news, not only were both of the broken keys present, but the tension springs were also there (although one was rattling around inside the unit). Here are the damaged keys. You can see from the photo that the key on the left has its little U-shaped clip. 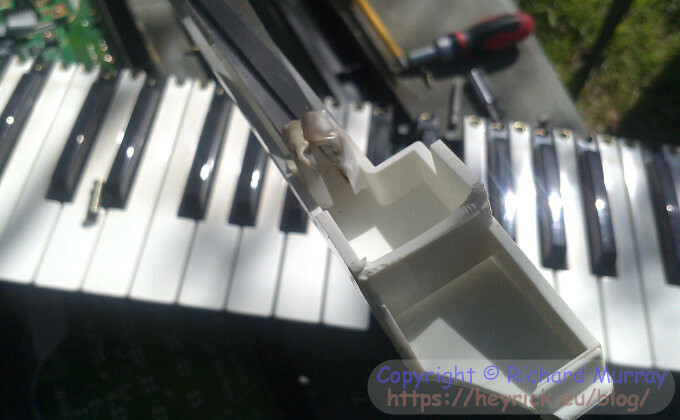 This needs to be glued to the underside of the key to make a slot into which the key guide fits. The guide is the lug covered in a rubber boot that you can see protroding from just below the edge of the visible circuit board. You can also see the cleverly simple way in which pressure sensitivity is implemented (I expect my Yamaha is similar). Each key actually activates two contacts, and the time delay between them registering as 'pressed' determines the velocity of the key. 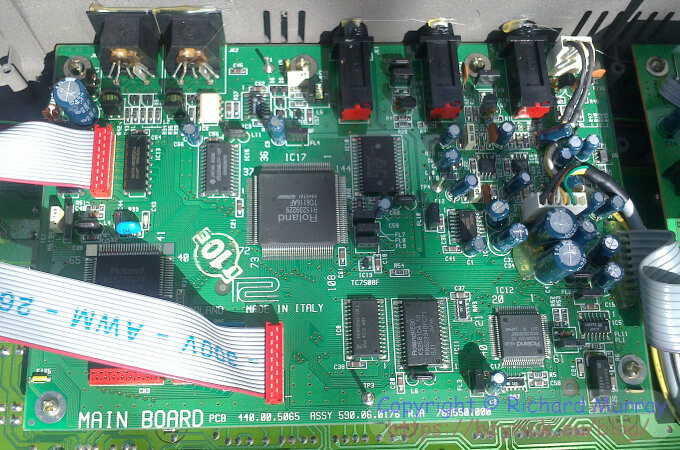 The next step, having seen that the circuitry looks "clean" is to power up and see if it works. No point wasting time on something dead, right? The keyboard wants 12V. 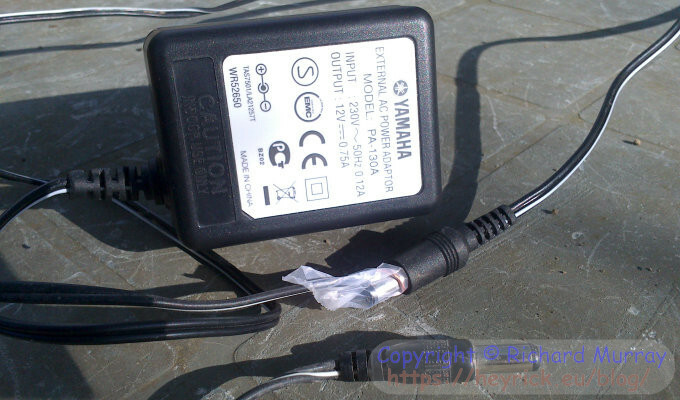 Unfortunately the polarity is opposite to that required by my Yamaha, however a spare lead from a dud power brick and a piece of sellotape sorted that out. It is odd, incidentally, that there was no provision for accepting batteries. There ought to have been space onboard for a set of C cells? Starting at the top left - a Toshiba TO6250GP. I'd guess a resistor buffer for the interface cable beside it. To the right of that, a 65256 (32KiB SRAM). The big upside-down chip is a Roland custom, ID'd as R15239229. I can't find any information on this, though I'm guessing it is the main synth chip. Continuing rightwards, another Roland chip, a R15279823. To the bottom row now, another Roland custom, a R15239124. This would appear to be a gate array, most likely for assisting with keyboard switch interfacing, plus the front panel buttons. Across a ways, an MB84256 which is another 32KiB SRAM. Beside that, an HN62334 which is a 512KiB mask ROM. It is marked Roland, so will contain the keyboard firmware. It is probably that large (half a megabyte) to permit it to hold a number of sound samples or algorithms for the variety of instruments available. 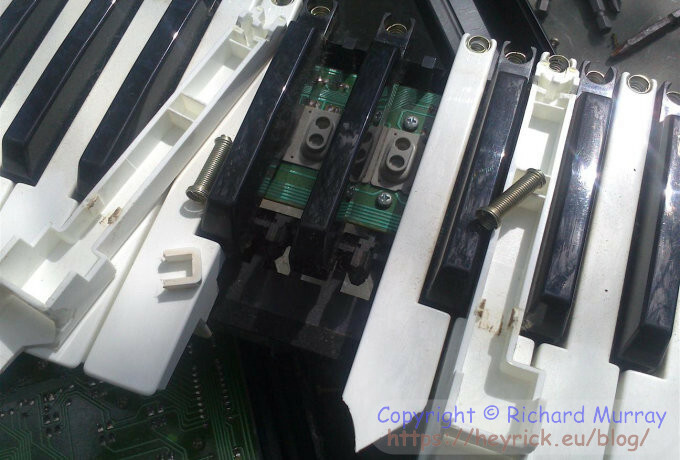 The final, on the lower right, is a Roland R6258103. Again, no information found, but given its proximity to the second SRAM and ROM, I'd peg this as the CPU. This is further backed up by the presence of a 20MHz oscillator just next to it. As for the two SRAMs, a random guess would be that one is for "housekeeping" (internal state, stack, the usual CPU/program stuff) while the other is for the recording function (the keyboard can hold up to 2500 notes) and also possibly as a small MIDI buffer. So, I plugged in the power, took a deep breath, and pressed the power button. There was a gentle pop from the speakers, and then nothing. An assortment of LEDs were lit and the display was saying something like "A11". So I pressed Middle C. Which sounded alright. Not quite as good as my Yamaha, and a million miles away from a real piano, but otherwise okay. I quickly tested all of the keys, using my knuckle to activate the pads of the missing keys. Everything worked. I pressed the Demo button and listened to some of the demo music. For a keyboard made in '94 the music sounded horribly eighties. But I know it was more recent because the LED display scrolled that I was listening to "Demo # Copyright Roland". I say more recent because the pointless copyright message was more important than something useful like a cutesy name for the piece. As far as I know, the demo songs might just carry a title as utterly boring as "demo song 6". Whoo. But, hey, the thing worked. Big smile! It doesn't look like much, but it works fine. The volume knob is missing, the speaker fabric is falling apart, and I'm not going to do anything with the broken keys for now. I don't know whether to try some DIY to fake the missing parts of the keys, or to look on eBay for spares. It isn't a big deal. I'm just impressed that a keyboard that would have set the owner back 4500FF (about £450!) in '94 cost me a fiver and an hour or so in fiddling around. This, ladies and gentleman, is the benefit of being a geek. Something broken? Let's roll our own fix! Maybe if the guys who owned this were geeks they could have fixed it up and carried on using it. Hey! What gives with the ugly watermarks? So while the Twitterati and intelligentsia were ranting away about "Big Content", we've just lost the ability to sell our own content. In other words, you've just been royally f**ked. You can read the complete article at http://www.theregister.co.uk/2013/04/29/err_act_landgrab/ (note - the F-word is not starred!). Now, I don't imagine there are many who would want to take my pictures and profiteer from them. It is a principle. One fraught with complications. I am a British person resident in France uploading to a UK domain hosted in the United States. - now proudly hosted in the UK now that people are starting to realise the implications of stashing their data in other countries! Likewise - YOU. Have you ever uploaded a picture or some other content? On a blog? Flickr? Facebook? As it should be, if you created a work on your own, you automatically own the copyright. The "on your own" part is important, for work you create at work is usually property of your employer unless you have a contract stating otherwise. Anyway. You take an awesome photo and post it on your blog from a Flickr upload. Well, the proposed law will allow commercial use of the work without the need for a licence, if the work is determined to be an orphan. Given that ownership metadata is routinely stripped - either for malicious reasons or technical (my image editor strips all metadata from JPEG as it just plain doesn't understand it), all the slimy punter using/selling your work has to do is prove that they have performed a "diligent search". What is a "diligent search"? Typing "photo of garden gate" into Google? It will rest with you now to prove that your work is yours, and to attempt to seek redress. It gets more interesting. A commentor on The Register pondered the possibility of a person (not you) uploading your photo to the BBC (which is known to strip off metadata). The image is used by the BBC, and they claim ownership of it through The Secretary of State (it is not clear if each image would need to be assessed, or if it is an automatic "did you check? okay, it's now yours" - I'm cynical enough to suspect the latter). The BBC are then made aware that the content is on your website, at which point they send a Cease and Desist, and/or a takedown, and/or a fee for licence for the use of the image. Yes, some other outfit could ask you to pay them for the use of your work which they think they own. It sounds crazy, doesn't it? It gets worse. The Act does not prevent sub-licencing. So an organisation who has your work could legitimately flog it off to others, like a big image library (think of Getty Images) built from all of the various pictures and images around which don't have obvious ownership details burned into them. The way to prevent this? Register your photos in a specific registry. At your own expense, of course. To this end, all of the images on my b.log over 300×300 are watermarked. This is automatic and is done by the server itself, not the b.log script (so linked "larger" images will also be watermarked). As of now, and until this stupid Act is burned, buried, and the ground salted - the watermark is here to stay. It may change, but it isn't going away. This is something we all need to fight. If you have a blog or website, add watermarks. If you have PHP and the ability to turn on the rewrite engine via a .htaccess file, you can instantly watermark all of your images. This is what I did - read details of how to do this. If you upload photos to social media or photo sharing sites, burn in a watermark with your photo editor. You have the originals, so don't be afraid to splatter your name across the one you upload. Some people may complain or call you a jerk, so just point them to the above Register article (or any other of your choosing). Most decent people would then understand the importance of ensuring your work does not end up stolen. Whether or not you delete existing images is up to you. I would, not because I particularly fear anybody taking my stuff, but as a point. An action. Like when sites go black to protest something or other. If people start to take their content offline, we'll all be a little worse off for this loss. If enough people do it, it will become less of a protest and more of a message. But the choice is yours. Write to your MP. Then write to somebody else's MP. MPs are not intelligent creatures, judging by this Act, so you can probably write a generic letter and post it to as many MPs as you can afford postage. Ask them if they support this Act, and if so, to justify this and do they realise the effect it will have on digital imagery on the UK's section of the Internet. The thing MPs want more than backhanders and cosy lunches with important people is your vote. If they are kicked out of office, they will - god forbid - have to find a real job. If enough people write to their MPs, those MPs might start to realise that this is an issue to be taken seriously. Not a Brit? Try writing to an MEP. If that fails, write to David Cameron (I assume "10 Downing Street, London" would suffice) and ask him if he is crazy. If you want to sound British, the phrase is "stark raving mad". Don't expect a personal reply. Other suggestions? Write it into the comments below. FYI: I have toned down the watermarks. It now only says the copyright line and the URL, and at uses alpha transparency to allow it to blend better into the image. In the process of making this change, I have altered the code so that pictures over 800px (these will be "big" versions of things, the ones used on the blog are sized to 680px maximum) have the watermark placed right in the centre of the image, double size [example]. This is because a small watermark at the bottom right of a large image is usually fairly simple to crop out or mask over. In the middle, it is harder. Don't you know? Big media (RIAA and the others) own everything. Everything they make. Everything you make. Everything. We will soon be expected to pay for a license to use our own photos. This is how it is going. Yup, Jess, I'm crying right now. A certain mouse is screwing up copyright all over the place, and arbitrarily retrospectively, yet *our* images and such are ripe for ripping off? What's with that?! Validation Are you real? Please type 17069 backwards. Last read at 10:49 on 2019/04/23.